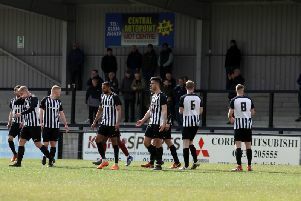 Corby Town produced an excellent second-half fightback as they moved to the top of the Evo-Stik Southern League Premier Division with a 3-1 victory over bottom side Burnham. Things weren’t looking great as the Steelmen trailed at the break but they produced a good second-half display to go a point clear at the summit with leaders Poole Town not in action. The Steelmen welcomed Herve Pepe-N’Goma back after injury but Edi Appleton wasn’t fit enough to come into the side. Things didn’t go according to the script in a poor first half as the Steelmen trailed at the break courtesy of Carl Davies’ goal on 19 minutes. But whatever Tommy Wright said at half-time clearly had the desired effect as the Steelmen stormed back after the restart. Spencer Weir-Daley continued his fine form in front of goal as he brought them level from a narrow angle on 50 minutes. And they took the lead soon after when Greg Mills was on target from 12 yards after the hosts had been awarded a penalty. The game was wrapped up seven minutes from the end when Wilson Carvalho struck to complete the victory and send Corby top. Steelmen: Walker; Kennedy, Anton, Pepe-N’Goma, Morley; Byrne, Taylor; Carvalho, Milnes, Mills; Weir-Daley. Subs: Thomas, Donkin, Chamberlain, Hoban, Wright. Goals: Davies (19 mins, 0-1), Weir-Daley (50 mins, 1-1), Mills pen (55 mins, 2-1), Carvalho (83 mins, 3-1).